Alfalfa growth started early this spring. We will likely harvest 2 to 3 weeks early to get dairy quality hay across most of the Midwest. There are a couple growth factors have not been adequately recognized. The first is that we were dry generally across the Midwest during late March and early April. Alfalfa needs good soil moisture for early root development during this time. The drought reduced root growth and means that first cutting yields will be less than they might be otherwise. The second factor is the cool weather that has occurred during the last two weeks of April. While frosts have generally not killed stems, overall growth has been reduced. The cool and wet weather has also increased some leaf diseases. Another factor is that some fields had significant numbers of crown buds develop this spring and stems 6 to 8 inches shorter than the tallest are present. In some fields this second growth may be 20 to 30% of yield and will contribute to higher forage quality than indicated by the tallest stems. When the terminal bud forms on a stem, no more leaves will be formed and stem will continue to grow only through elongation of internodes between existing leaves. Buds are forming about 2 to 3 weeks earlier this year than ever before. Alfalfa leaves change little in forage quality with maturity until they turn yellow and die. The major cause of forage quality decline is stem increase as a percentage of total dry matter (from less than 10% to over 50%) and then the stem declines in digestibility as it matures. On cool and cloudy days, there is also less photosynthesis, so less starch is produced and less non fiberous carbohydrate accumulates in the leaves. When to cut – High forage quality will be crucial, especially with the high grain prices and falling milk prices. On the other hand, harvesting too early will reduce total yield for the season and, possibly, increase winterkill this coming winter. So, to harvest at 170 RFV, the best estimate is to clip a sample (at the same cutting height the mower is set for) and have it analyzed at a forage testing laboratory. 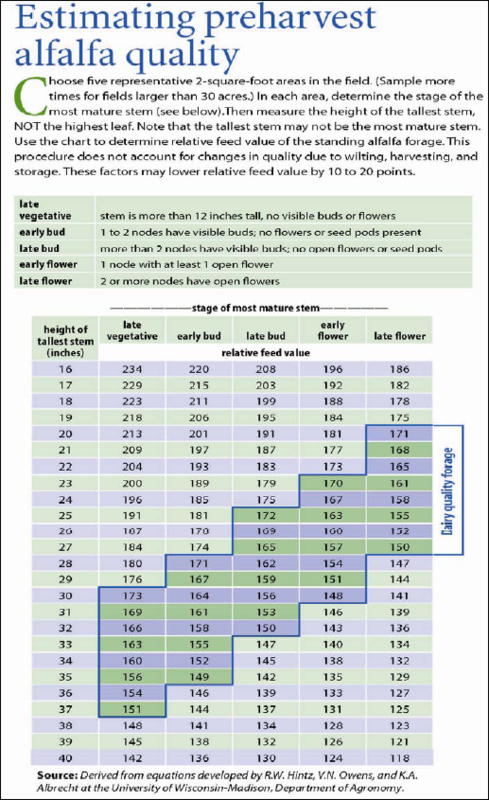 The second best estimate is stem height as shown in the chart on the following page. Think of cutting when alfalfa is 24 to 26 inches in height; in some areas plants will remain short due to the early drought and leaf loss now may reduce forage quality below shown levels. Alfalfa bud and flower stages will be no indication of forage quality this year. Grasses are generally running about normal in maturity so grass heading will often be after the alfalfa should be cut, but if grasses begin to put out head, cut immediately. Use Inoculant – We always recommend use of a Lactobacillus inoculant on first cutting because bacteria levels are naturally low on alfalfa grown under cool weather conditions. I believe that the recent cool weather will increase the value of added inoculant to chopped forage. Use of inoculant has been shown to be most beneficial if the forage can be ensiled rapidly; forage left laying in the field for more than two days will likely not benefit from added inoculant. Also, benefit of inoculant use for baleage is doubtful due to inability to get good coverage as forage is being baled. We may be adding a cutting this year due to the early timing of first cutting. A crucial step will be to let second cutting go to first flower to rebuild plant health (and possibly 4th cutting also if 5 cuttings are taken before September 1). The second consideration is to ensure that adequate fertility is present for regrowth. Alfalfa requires 50 to 55 lbs potassium and 5 lbs sulfur per ton dry matter of forage and some boron. Stands should be fertilized after first cutting. Further trace elements are not needed unless deficiency is indicated by an alfalfa tissue test.